Recently, during the course of a lazy Sunday afternoon, surfing around on social media, I came across a comment thread discussing cordless drills. The original post was enquiring as to the best brand but the conversation quickly turned into an argument (as it often does on social media) about which voltage makes for a better cordless drill, 20V MAX or 18V?. More specifically 20V Dewalt and 18V Makita, with the majority vouching for the 20V MAX Dewalt. Why? Well, 20V is more volts and you know them volts, the more the better. Right? 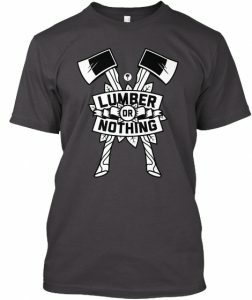 With the question regarding the better brand, unfortunately, my answer might be a bit bias as I’ve been a die-hard Makita fan ever since I bought my first power tool. However, as for voltage, I may have a little experience and knowledge to share. First off, I need whoever may be reading this to understand that the voltage and amperage printed on these tools are an indication of what the battery can supply to the tool. That’s why these labels are often on the battery only and not on the tool. You see folks, the harsh reality is, and this comment is specifically aimed at those who swear by the 20V MAX batteries as opposed to the 18V, is that the two are one in the same. Yes, ever wonder why 12V and 20V lithium cordless tools have the big bold “MAX” printed after the numeral but the 18V doesn’t? It’s because an 18V battery can charge up to 20V just like a 10.8V can be charged up to 12V (in the case of lithium batteries). This means that the MAX refers to the maximum voltage the battery can store as opposed to the 18V that refers to the nominal voltage of the battery cells added up. A battery is made up of cells that are able to store a charge. The accumulative voltage of the cells (cells connected in series) will be the voltage of the battery. 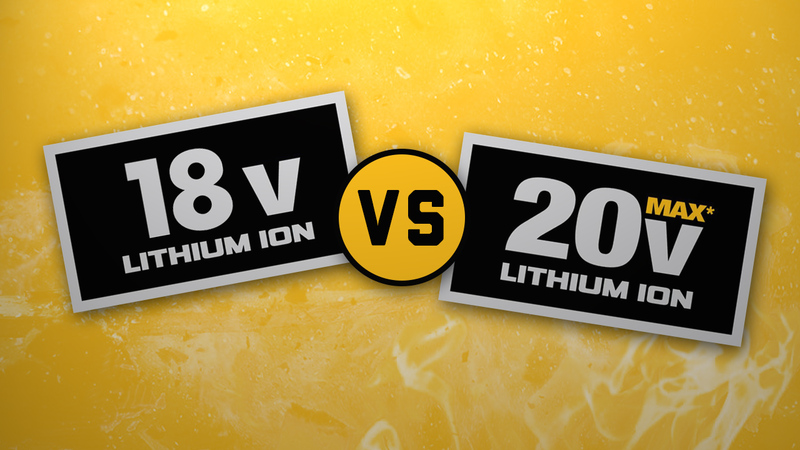 In the case of a lithium-ion battery, the nominal voltage of each cell is 3.6V. This means that an 18V lithium battery consists of 5 x 3.6V lithium-ion cells in series and in the case of a 10.8V, there are 3 x 3.6V cells. If you open up an 18V battery along with a 20V MAX battery you will find that they both contain 5, or multiples of 5, cells. In the case of multiples of 5, two or more sets of 5 (in series) are connected in parallel to increase the amperage the battery can supply while the voltage stays the same. Example: One set of 5 cells make up a 1.5 Ah 18V battery while adding another row of cells in parallel could make up a 3 Ah 18V battery. This should be the real discussion taking place when comparing batteries as Ah plays a much larger role in the performance of a cordless power tool. Well, let’s be honest, as consumers we want the most for our buck. We all want to be a savvy shopper and unfortunately, the manufacturers and marketers take advantage of that. They are marketing very much the same product while only expressing the specs in a way that would be more appealing to the uncertain consumer. Realistically speaking, an uncertain person shopping for a cordless drill will likely opt for the larger voltage as it would be fair to assume it to be better if that person has limited knowledge of electricity and lithium batteries. In the image above are two identical drills. One sold it the states while the other you would find retailing in eastern countries like the UK. Can you guess which is which? Yes, that’s right, the 20V MAX is being sold in the USA while the rest of the world are buying 18V drills. Are they getting less for their buck? No. Besides the stickers, there is no difference between these two drills. 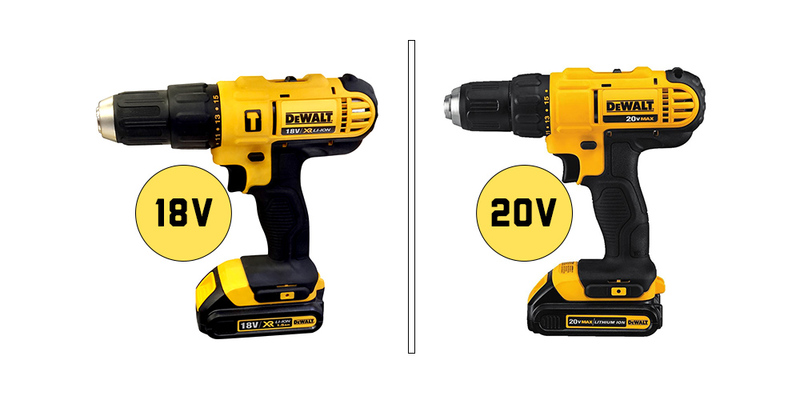 Note: The above example is not to be confused with the Dewalt 18V Nicad and the 20V MAX Lithium. The example shows two drills with Lithium-ion batteries. In the USA, Dewalt, among other manufacturers, market their Nicad drills as 18V and their Li-ion drills as 20V MAX. Consider a scenario where two cordless drills from different manufacturers both have 2.0 Ah lithium batteries but the one is marketed as a 20V MAX and the other an 18V. It is not at all to say that the 20V MAX drill can deliver higher RPM, torque or operating time of a single battery. As consumers, when having to make a decision between two cordless power tools as explained in the above scenario, the voltage should not even be considered as an indication to what would be the better performing power tool. Please note that this post is no way intended to discredit any power tool manufactures. 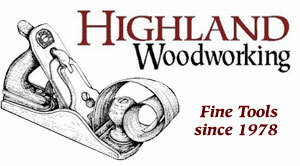 All the tools I named it this article are quality power tools for one reason or another.  The purpose of the post is to clear up any uncertainty around the 2V discrepancy regarding 20V and 18V cordless power tools. ← Repair OR Replace Faulty Cordless Drill Batteries? I like it. My dad is the handy one in the family and would know this stuff. I would be the one that went to the store and saw the “larger” 20V maxx one and ran with it. This post makes me take a second look at things like voltage and how a manufacturer will manipulate the facts to support a certain way of thinking. Very well done and informative! Thanks and keep ’em coming! Thanks for stopping by. I’m glad you found the info useful. Many people only look at voltage when purchasing cordless power tool while the truth is, a 18V might not even be what you are actually looking for at all. I personally find myself using my small 10.8V(12V MAX) Bosch cordless drill on 95% of my projects because it is so light and convenient. Love it!! Very informative and lots of great information that I didn’t know. I’m in to Diy projects, so this will be of great value to me in the future. I’m a Dewalt fan, but I like Makita also. But since you mentioned how light the Bosch is, that may be my next purchase when the time comes! I will definitely be checking back for more info. I was looking at drills on sale and suspected there was something fishy about the 18v vs 20v drills. You explanation confirmed my suspicion. Informative. Thanks..
Good luck finding the right drill for your needs. I have an 18 volt Porter-Cable set consisting of 7 different tools. The drill and drill driver will hold a charge for hours, but when I use the reciprocating saw or the circular saw the batteries will only last for a few minutes! I thought about replacing the 18 volt battery with what I thought would be a more powerful 20 volt replacement. Boy was I surprised to find out that the new 20 volt battery will not fit in an 18 volt tool. Porter-Cable redesigned their cordless tools to only accept the new 20 volt lithium ion battery. Based only what your article says, Porter-Cable saved me the cost of purchasing several 20 volt lithium ion batteries. Higher RPM tools do drain batteries much faster. That’s why they tend to be supplied with higher Ah batteries. An example would be my 18V Bosch cordless drill and grinder. Their batteries are interchangeable but the grinder requires a higher Ah to function correctly. I normally use a 1.5Ah battery for my drill but at least a 3Ah for the grinder.